Land of the Sky Cowboy Church brings a unique brand of Christ centered messages and worship. Join us at the Land of the Sky Cowboy Church in Western North Carolina. Located in the mountains of Asheville, NC, we hold weekly services as well as travel the globe bringing a "Church in the Dirt" like nothing you've experienced before. It's a casual setting bringing the Good News of Jesus Christ. 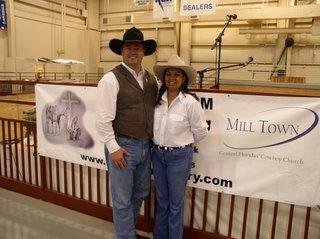 On March 11, 2006 Mill Town Cowboy Church of Central Florida will venture out West to a small town outside of Plant City called Lithia. It will be our first effort at planting a Cowboy Church post since beginning our ministry in Kissimmee-St Cloud this past August. The event called Cowboys in Concert will be held at the Holmes Equestrian Center on Lithia-Pinecrest Rd and Highway 39. This area has a vast array of equestrian facilities and riding stables. I was introduced to Mike Holmes through one of the bullriders that attended our church in Kissimmee but has since moved to Tampa to work horses and cows. 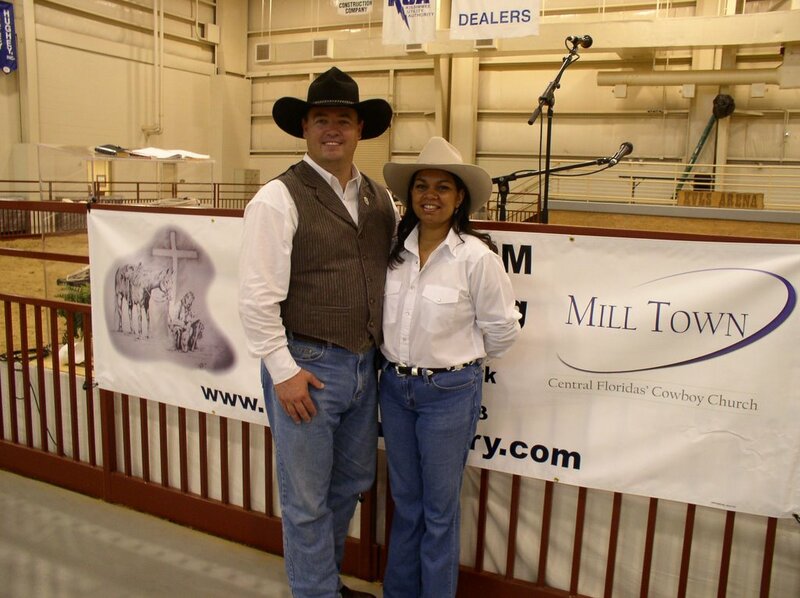 Mike along with his wife Denise publish Horse and Tack magazine which is the largest horse publication in Florida. When Mike and I met it was like a light went on and a common ground was immediately established. We decided to make this a preview event to introduce cowboy church to the area. Our goal with a cowboy ministry is to reach those that might not feel comfortable going to a brick and mortar building for church. Someone who hasn't been to church or just fallen away because they didn't feel like they fit in. Here you can come as you are, boots, jeans, big buckles and cowboy hats, are all welcome. The event begins at 5:00 PM on Saturday March 11 with a cookout, hot dogs, hamburgers, games for the kids and just a fun time. Then at 7 PM we will be featuring two local Cowboy Gospel musicians. Travis Lewis from Turkey Creek and Tommy Brandt from Sebring, Florida. Travis has played on the Grand Ole Opry stage with Hank Snow and has a unique style and sound with a powerful gospel message. Tommy has won CCMA New Artist of the Year in 2004. After the music we will present the Gospel message, the Good News of Jesus Christ. This is an exciting time as we answer Gods call to share the love and grace given to us through Jesus Christ. I hope you will come and join us as we saddle up into a great adventure. The 117th Silver Spurs Rodeo was held this weekend, February 17-19, during the Osceola County Fair at the Silver Spurs Arena in Kissimmee, FL. This 3 day event brings cowboys and cowgirls from all over the U.S. to compete in Bull Riding, Bronc Bustin, Roping and Barrel Racing. I recieved a call on Monday from one of the top hand committee members asking if our church, Mill Town Cowboy Church, could provide volunteers for the weekend. This was a big opportunity to get involved. So without having any volunteers to commit to the event I said "Yes !" and then began calling that minute to locate our members and arrange volunteers for the weekend. It turned out to be some of the largest crowds to date since the new indoor arena was build 2 years ago. Sunday morning we began Cowboy Church at 11am with Travis Lewis singing his unique brand of Cowboy Gospel music. Ben Lee, a PRCA Bull Fighter, gave his testimony how Christ has changed his life while working on the rodeo circuit. 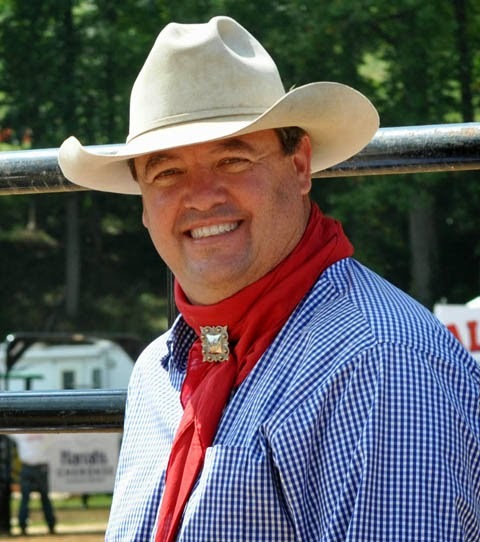 Randy Johnson, who is the Chaplain for the Junior and High School Rodeo Associations in Florida and founder of Reality Ranch Ministries shared a message on living each day as an example for others to see. The Cowboy Church was held in the Hospitality Room and over 40 Cowboys and Cowgirls attended the service. After the service was over we passed out nearly a case of Cowboy Bibles and Travis gave away 65 of his CDs. Land of the Sky Cowboy Church and Cowboy Ministry. Meets wwekly to share the Good News of Christ.